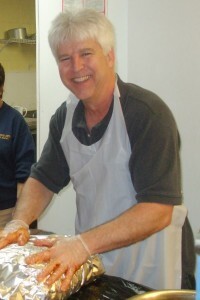 Phil gets the birds ready for roasting. That comment was overheard and much appreciated by the students and staff who started the preparation 14 hours earlier; and reflects on a tradition that started when Cherokee Creek Boys School opened eight years earlier. From its first year, Cherokee Creek Boys School was committed to celebrating the traditional Thanksgiving feast with our own special flare. We wanted our students to feel the joy and excitement that comes with this holiday and to be able to create rich memories that they could take with them when they graduated. The central ingredient of any Thanksgiving is the turkey. At CCBS we decided to create a ritual around the preparation by pit-roasting the turkeys. This is a fabulous ritual that is present in cultures all over the world. At CCBS we start with selecting student volunteers for a special “turkey team” who prepare the pit in advance of cooking the turkeys. Then at 1:00am early Thanksgiving morning these boys wake to build a bonfire over the pit and continue to feed a roaring fire for the next four hours. At the end of that time the pit is full of red hot glowing embers. Once we have this bed of coals, we bury the turkeys (this year we had 5 turkeys) surrounded on all sides and top and bottom by at least 6 inches of coals. Then the pit is covered with dirt which seals in the heat and allows the turkeys to slow roast. Just before dawn, the turkeys safely roasting in the pit, the boys head back to bed, tired, a little smokey, and full of satisfaction for a job well done. Six hours later, the “turkey team” is back to carefully uncover the turkeys. This is no time for a stray shovel blade to pierce the wrappings, so the students proceed with archeology-type precision. Once uncovered, the turkeys are brought to the kitchen where they are carved and presented as the central piece of a grand feast. It is remarkable to watch the transformation as these boys take ownership and pride in this monumental task. They spent the night growing in friendships and memories, they see the spectacle of the feast and the shining eyes of those gathered to help celebrate, and they take pride in hearing the words of praise and knowing of their part in this meaningful tradition. For more about the process of pit roasting turkeys at Cherokee Creek Boys School, click on Bear Tracks Newsroom for photos of this year’s Thanksgiving holiday celebration. Five members of the team at about 1:00 AM Thanksgiving morning. From left: Jon, Adrian, Daniel, Calvin and Drew. It’s 12:30 AM Thanksgiving morning; it’s cold, dark and most people are sleeping. But 6 Cherokee Creek Boys School students are slowly waking, dressing and making their way into the dark to our turkey roasting pit. 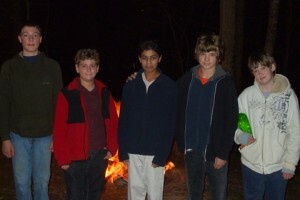 These 6 boys are the 2010 Turkey Roasting Team, who have eagerly volunteered to stay up all night feeding logs into a bonfire to create a massive bed of coals. The fire must be carefully tended and fed for 5 hours to create enough coals to cover five turkeys…the main course for the coming Thanksgiving feast for CCBS students, staff and guests. Once the turkeys are covered with coals, the entire pit is covered with dirt to seal in the heat and allow the turkeys to slow-roast for another 5 hours. It’s a lot to ask of any teen to give up sleep, be fully attentive and be self-managed throughout the night, but our team meets the challenge with determination, enthusiasm and a large amount of fun. Pit-roasting turkeys for Thanksgiving has been a tradition since we opened CCBS…a ritual that has been passed on by each generation of students. There is something comforting and meaningful that keeps us returning to the same traditions every year. Rituals, traditions and celebrations have the power to strengthen and unify families…yours, the CCBS family and the society at large. At CCBS our mission is to, “challenge boys and their families to discover what is real and true about themselves and the world around them.” I imagine that, while quietly staring into a crackling fire, the members of our Turkey Teams have discovered something about themselves. No doubt they have thought about their families at home. And, maybe their thoughts were also that they are stronger than they thought, more focussed than they thought, or just more sensitive to the world around them than they thought. Their normal markers and priorities are shifted during this night-long vigil and they become more in tune with the rhythms of the world. It is remarkable to watch the shift in myself and our students as the night slowly creeps along. This “CCBS family” tradition seems to feed our souls as well as our bodies. Just before dawn, with the job completed, these 6 boys make their way back to bed tired, happy and full of a sense of accomplishment. As most of our boys prepare to return home soon for the holiday break, I challenge you to reflect upon the “real and true” traditions and rituals that define your holiday season and add meaning to your family’s celebration. And I wish you a wonderful celebration of discovery!